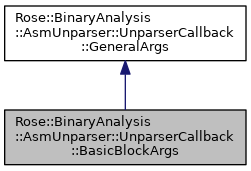 Arguments passed to basic block unparsing callbacks. Definition at line 292 of file AsmUnparser.h. Definition at line 296 of file AsmUnparser.h. The basic block being unparsed. Definition at line 297 of file AsmUnparser.h. The instructions contained in this basic block. Definition at line 298 of file AsmUnparser.h.